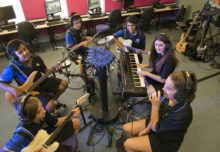 Lalor North Secondary College has been a Champion School for the musical futures model for the past two years. Classroom and Percussion teacher Dino Azzollini is the facilitator of the program and heads a team of highly energetic and skillful instrumental and vocal staff at the school. 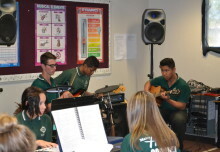 Lalor North Secondary College is a 7-12 school and music is one of most popular electives. The music program at the school has grown over the past few years due to the hard working staff at the school: Lou Rossini, Annie Rossini, Phil Smardenkas, John Smardenkas and, especially, due to the support of the school principal Denise Veltre. The program’s strength is due to the fact that classroom and instrumental teachers work hand in hand to achieve its goals. Harnessing the love of music through performance-based classes and to enable students to experience and participate in music making. Dino works tirelessly in liaising with local primary schools in the area. Workshop days with primary schools, where the Musical Futures model is employed have been extremely successful. Students from years 5 and 6 are skilled up with a basic four-chord song on instruments that most of them have never played before. By the end of the morning session they perform the song to an audience at the school and record it. 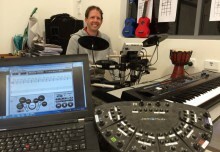 Apart from a large classroom and rehearsal rooms, Lalor North College has a well-equipped recording studio run by Phil Smardenkas. 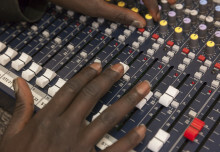 Primary school students are invited to record at the school and are presented with a CD at the end of the year. All this culminates in the “Big Night Out” which is an evening concert at the school, where local primary schools and our own students perform in front of 700 people. We aim at inspiring, engaging and motivating students to participate in music making. Create initiatives that grow and build good relationships with students and develop an engaging and rewarding learning environment. In addition we encourage and assist to develop skills and knowledge for students who decide to undertake music as a profession in the future through our VET music program at the school. 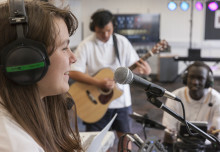 As a VET/VCE music provider in the northern suburbs, Lalor North College also has students from other secondary schools learning under the Musical Futures Model. Through Musical Futures workshops and PD days, the school has supported local primary and secondary teachers in the region and across the state. Teachers have been given the opportunity to come to the school to observe the model in action. David Price the architect of Musical Futures in the UK has conducted in-depth workshops at Lalor North College for the past two years. These workshops have been well received and highly beneficial to schools already involved with Musical Futures program and to schools wanting to employ the program.